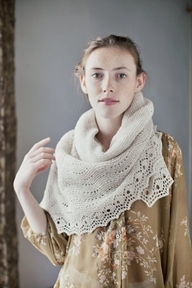 I am ordering some more Brooklyn Tweed patterns today including the Quill Shawl shown above. I am also considering ordering some of their yarns – but I need to find out about import duty etc before I do so. The Spring weather has gone and there is a cold, north wind today. I have been to the hairdresser this morning and did some grocery shopping for the goulash I am going to make tomorrow. Tonight we are going out for a few drinks and then collecting an Indian takeaway on the way home. Jackson went out at 3.57 a.m. this morning – he woke me up by banging on the bedroom door. He has just come back and gone straight to bed. Sometimes I wish I were Jackson – no parcels to pack, balls of yarn to find, missing parcels to worry about……..! No other news today, I am going to have a rest now and read the newspaper. No petrol in our local garage at the moment but I still have half a tank and so am not unduly worried. People are just panic-buying, there is no real confirmation that there is even going to be a strike. Right! Here is the next question for the contest: Can you name six towns or cities in the USA that have their names in common with towns or cities in the UK? Answers to jannette@easynet.co.uk with cities as the subject. Send by midnight Saturday. My designer has just made me a Facebook page – if you could go here and post a comment or like it, I would be very grateful! I need 30 likes in order to get a URL of my own! I am working on the next questions and will post it early tomorrow. I am a bit behind today as we overslept and I have not caught up and it is almost dinner time already! So, back early tomorrow with new questions! Today there is free shipping on all Sale items apart from books. I just love this Tinder Cardigan from Brooklyn Tweed – it is so stylish and yet casual. Can you think of words that sound the same but are spelt differently in the UK and US. Eight letters for them to begin with – one word for each letter. Answers to spelling@jannettesrareyarns.co.uk by midnight Wednesday please! We have a busy day tomorrow. We are taking the ride on lawn mower for a service – John is loading it on the trailer right now. Then his Land Rover has to go for a service, then we have to go and get canes for the runner beans! And do some shopping somewhere along the line. John is now thinking of going to Ireland in mid April. Good time for a big yarn order!! Got to take Slip out now – she is standing staring at me! Back tomorrow. The beautiful Brooklyn Tweed Permafrost shawl – another project for my list! Trouble is, my list is longer than the number of days left in my life!! We went to Smith’s last night. I had JumboTiger Prawns in chilli for my starter and then I had them again for the main course ( a larger portion). Kevin had Scallops followed by Dover Sole, Lynn had Calamari followed by Scallops, Steve also had Calamari followed by Fillet Steak, Joanne had a Crab followed by Sea Bass and John Had Goujons of Place followed by Beer Battered Cod. No vegetables supplied and so we had Spinach, Asparagus, Chips and Peas. No desserts, 5 cups of coffee. Total bill was £331 ($525). Oh, we also had one bottle of still water and 2 bottles of the house wine. I thought it was expensive. It was nice but not over the moon!! Anyhow, it was an easy way for us to thank them for looking after Slip. Jackson had regurgitated during the night – I have washed his hammock and he has gone back to sleep in a clean one. I have not given him anything apart from his special biscuits, maybe he ate something out! Roast beef is in the oven…….I think I will prefer it to Tiger Prawns!! Must dash, Back tomorrow.